Just as ivory was once prized for its luminous beauty, the people of République de Côte d’Ivoire﻿—so named in the 1400s when French sailors began trading ivory there﻿—are today valued for their inherent spirituality, childlike faith, and eagerness to learn. Located on the Gulf of Guinea in western Africa, this tropical country takes in as many as sixty different tribal groups. Muslims and Christians, who are often Arabic or French immigrants, make up 25 percent and 10 percent, respectively, of the country’s thirteen million inhabitants. Because Ivory Coast has enjoyed relative political stability and economic success since declaring its independence from France in 1960, many Ghanaians, Liberians, Zaireans, Congolese, Guineans, and Ethiopians have also moved there. The gospel came to Ivory Coast primarily through students who, having embraced the restored gospel while studying abroad, returned to their homeland. In 1980 Lucien Yapi Affoue and his wife, Agathe, were converted in Lyon, France, where Lucien was studying. After being sealed in the Swiss Temple, the Affoues and their three children returned to Ivory Coast’s largest city of Abidjan in March 1984. Ivorian Phillippe Assard, who had been studying in Germany, joined the Affoues in Abidjan in 1986 with his German wife, Anelise, and their two children. By 1987 Ivory Coast had sixteen members. Elder Marvin J. Ashton of the Quorum of the Twelve Apostles dedicated the land in 1987, and in 1988 Cherry Silver and her husband, Barnard Stewart Silver, became the first missionaries to Ivory Coast, followed in 1989 by Robert and Lola Walker. The Abidjan Branch was formed in 1989, and the Church received legal recognition in 1991. 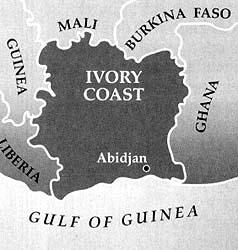 Today the Ivory Coast Abidjan Mission has fourteen French-speaking branches, two districts, and more than two thousand members. Sixty full-time missionaries from all over the world serve in the mission, including more than thirty Ivorians. As is common elsewhere in the world, Ivory Coast converts often make great changes to embrace the gospel. After he retired as an army officer and before he heard about the Church, Mamadou Zadi decided to open a bar. His business venture was enjoying great success when he met the missionaries. Convinced of the truthfulness of their message, he joined the Church and transformed his bar into a meetinghouse for the Agoueto Saints. Seventeen members of Brother Zadi’s immediate and extended families followed him into the Church, and his son and nephew have served full-time missions in Ivory Coast. To highlight their goal of creating a stake, Ivorian members have adopted “SOS” as their slogan, which means “Start Our Stake.” Like the exquisite ivory figures carved by artisans of old, the Saints of Ivory Coast are today becoming beautiful, polished instruments in the Lord’s hands. Hermine Horman, released from the Ivory Coast Abidjan Mission in 1994, serves as a temple worker and is a member of the Mount Olympus Fourth Ward, Salt Lake Mount Olympus North Stake. Sister missionaries (left to right) Patricia Kouassi, Emma Yavo, Evelyne Mfutilla, and Judith Seri. The Affoues were one of Abidjan’s first member families. President Affoue presides over the Bouake First Branch. Ivory Coast seminary coordinator Mandy Gueu.